The citizenry of Tampa are readying for pirates to descend upon their fair city for its annual Gasparilla Pirate Festival and Parade of Pirates. Founded in 1904 (originally as a promotional stunt), the festival honors Jose Gaspar, Tampa's "patron rogue". Gaspar, also known for his courtly manners and as the "last of the Buccaneers," is said to have terrorized the waters off the city, and may have left buried treasure somewhere along the coast. The celebration kicks off along downtown Tampa's Riverwalk on Jan. 26, and will feature the 102nd Gasparilla Invasion and Parade presented by Ye Mystic Krewe of Gasparilla. Pirates aboard the Jose Gasparilla and accompanied by its festive flotilla, sail the Seddon Channel as they take over Tampa. After the "krewe" successfully captures the city (yet again), the pirates celebrate with a victory parade at Bay to Bay and Bayshore boulevards, with more than 100 floats, marching bands, krewes and more. It's more doable than you think. According to travel site Skyscanner, there are plenty of flights from Fresno to Tampa in that time frame, and the prices aren't too shabby. Currently, the cheapest flights between Fresno and Tampa are if you leave on January 24 and return from Florida on January 30. Frontier Airlines currently has roundtrip, nonstop tickets for $233. If you fly out of Fresno on January 24 and return from Tampa on January 29, Frontier Airlines can get you there and back for $268 roundtrip. To plan your stay, here are some of Tampa's top-rated hotels, according to Skyscanner, that we selected based on price, proximity to things to do, and customer satisfaction. If you're looking for an inexpensive place to stay, consider The Safety Harbor Resort and Spa. The hotel has a 4.7-star rating on Skyscanner, and rooms are currently available for $95. A pricer alternative is The Renaissance Vinoy Resort and Golf Club. Rooms are currently set at $199/night. This St. Petersburg spa hotel is near the Renaissance Vinoy Golf Club, the St. Petersburg Museum of History and The Pier. Additional attractions include the Sunken Gardens -- a botanical paradise situated in the heart of St. Petersburg, Florida. If you're looking for an inexpensive place to stay, try Sailport Waterfront Suites. The 4.6-star hotel has rooms for $83/night. Don't miss Tampa's food scene, with plenty of popular spots to get your fill of local cuisine. Here are a few of the top-rated eateries from Skyscanner's listings. If you're looking for a local favorite, head to The Columbia Restaurant, which has an average of 4.8 stars out of 29 reviews on Skyscanner. "A visit to Columbia in Ybor City is a must, " wrote visitor Harold. "Florida's oldest restaurant delivers on great food and atmosphere. Although the restaurant is massive, it manages to maintain its charm." Another popular dining destination is Bern's Steak House, with 4.7 stars from 27 reviews. Also worth considering is 400 Beach Seafood and Tap House. "Good customer service and outdoor or inside seating makes it very flexible for different social situations, " wrote Aya. "Great food, amazing location and the early specials (3-6 p.m.) three course meal menu makes it a good deal." "Upscale dining at an affordable price, " wrote Nicolas. "If you like mussels this is the place to get them as an appetizer. Save room for the filet mignon (probably the best in town). For lighter appetites, the avocado crab salad is fantastic as a main course." 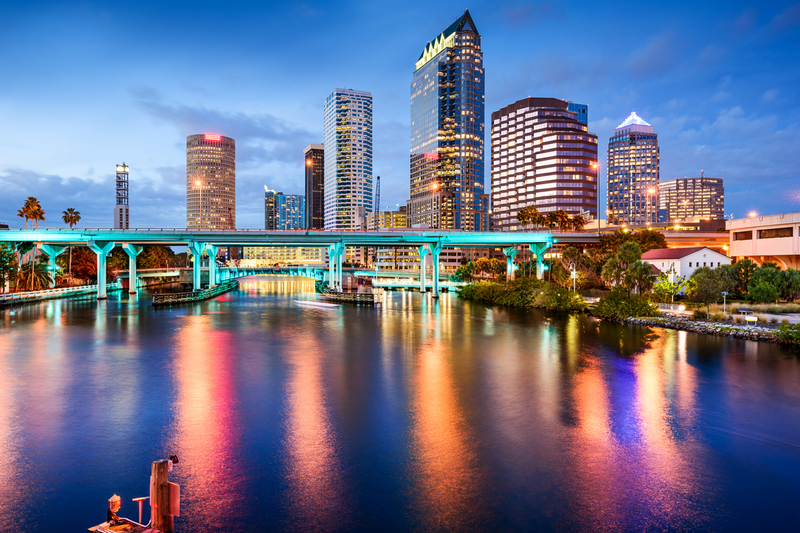 To round out your trip, Tampa offers plenty of popular attractions worth visiting. Here are some top recommendations, based on Skyscanner's descriptions and reviews. First up is Busch Gardens. "My favorite park, " wrote visitor Claire. "The best roller coasters and the queues are much less than Orlando. It's worth the drive. The gardens and safari are great." Ruth Eckerd Hall is another popular destination. "Check the schedule for current performances, " wrote visitor Matthew. "This intimate venue is a great opportunity to experience many amazing artists."